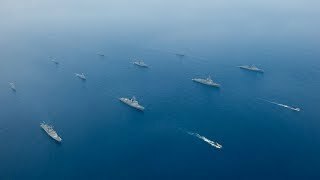 aritime Task Flotilla 7 (제7기동전단) is the strategic maneuver element of the Republic of Korea Navy based on Jeju Island Naval Base. It was established on February 1st, 2010 and is composed of Maritime Task Squadrons 71 and 72 (제71/72기동전대). Armed with hundreds of long-range surface-to-air, anti-ship, and land-attack cruise missiles, the MTF-7 is undoubtedly the strongest surface group in the ROKN. Three Sejong the Great-class AEGIS destroyers, six Chungmugong Yi Sunshin-class destroyers, and twelve aircraft make up the core component of MTF7. Three additional Sejong the Great-class destroyers currently under construction will be assigned to MTF7, increasing the number of squadrons from two to three. 대한민국 해군 제7기동전단의 SLBM대응 대잠수함전 훈련 모습.